The TAG Heuer Diamond Fiction Women’s Watch is a remarkably rare and stunningly beautiful timepiece. Only three of these extraordinarily chic watches have ever been produced, making this gorgeous timepiece a priceless staple for those few who have been fortunate enough to wear it. This stunning women’s timepiece is set with 879 full-cut Top Wesselton diamonds totaling 5.8 carats in weight. The watch’s unique, digital display illuminates 54 of the TAG Heuer Diamond Fiction Watch’s 879 exquisite diamonds to display the time. These 54 diamonds are specially cut to maximize the light’s concentration and thus the image displayed by the high definition LED lights. These lights emit their glow from beneath the precious gems and display the time with a warm, red glow complemented by the watch’s red, satin strap. 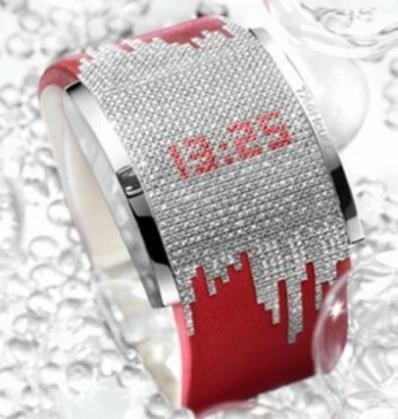 The Diamond Fiction Women’s Watch blends futuristic style and technological innovation with its superbly stylish appeal. The thick strap of the timepiece further lends a contemporary look to this luxurious timepiece that not just a watch, but an exceptional piece of Haute Jewelry. Introduced by TAG Heuer in 2005 during their “Year of Diamonds“, the watch was first shown by movie star Uma Thurman. The timepiece has an estimated value of over 100,000 Euros.